Master Bathroom Final Reveal – Uniquely Yours… or Mine! So the Master Bathroom is D-O-N-E, as in there is nothing left to do and we love it, it’s perfect for us and most importantly I’m very glad it’s finished! 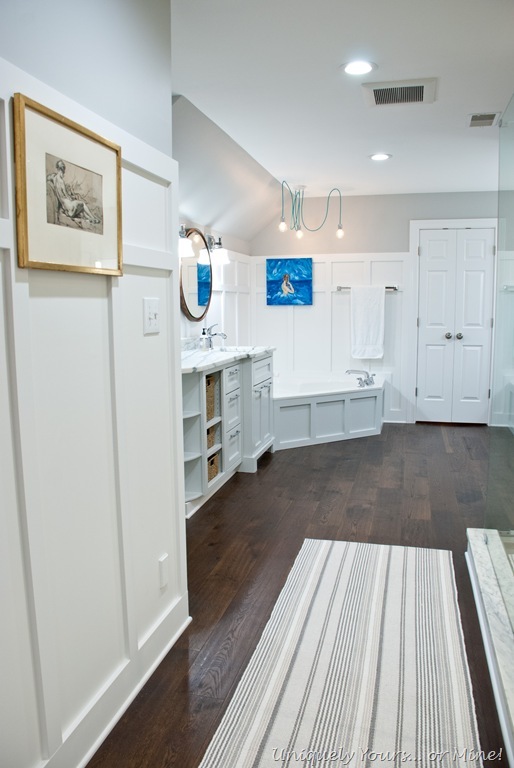 So the photo below is a view from the bedroom into the bathroom, the top of the walls are painted Benjamin Moore Stonington Gray (same as the bedroom) and the wainscoting is painted Benjamin Moore Decorator’s White. The new recessed lights are all LED in a daylight temperature as we like our bathroom to be nice and bright! 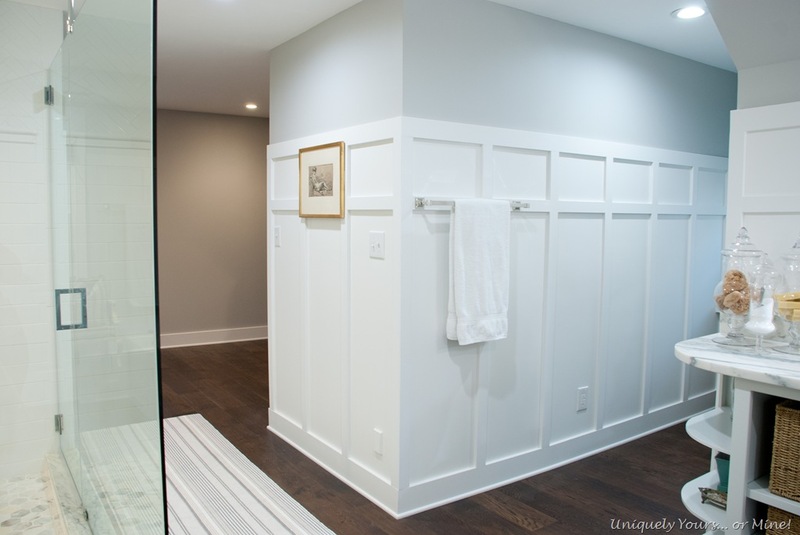 You can get a glimpse of the closet at the end of the hall which is painted the same as the bathroom, but the lighting is a soft white which is why you see a color difference, crazy right?! 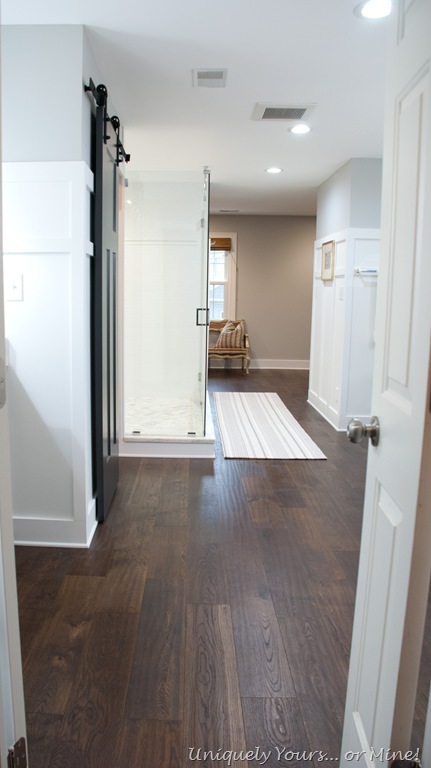 And “yes” we love the engineered wood floors in our bathroom and have had no issues with them at all! I installed all of the board and batten myself and let me tell you it was no fun… a ton of sanding, caulking, painting, design layout etc. went into this project. I chose to use pre-primed MDF boards in standard sizes and I just love the final look, very upscale and traditional. If you’re curious each wall panel was configured based on the length of the wall vs. each panel being the same size and then you end up with an odd sized panel at the end… I only had 2 small walls where the panels look larger than the rest of the panels, other than that the panel size differences between the walls are very insignificant. The mirror is from West Elm, but the original wood frame was much lighter than I thought it would be. I darkened the frame by wiping on a coat of Dark Walnut stain, super easy and it only took a couple of minutes. The color of the frame is now very close to the color of the wood floor. Two sections of this vanity I purchased off Craig’s List months ago, but my Hubby made the curved shelf piece at the left end to finish it off. 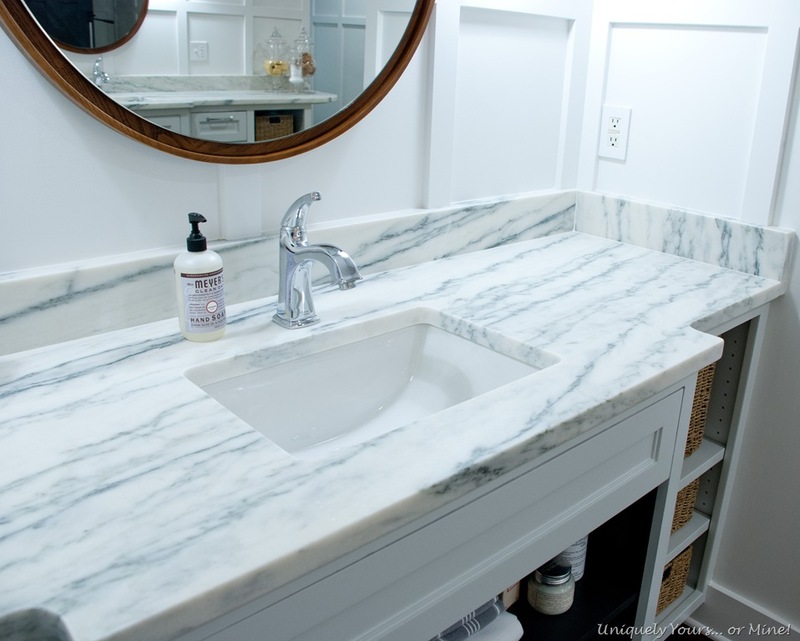 The vanity top is honed White Mountain Danby marble from Vermont, it’s beautiful with loads of grey veining and it has a hint of blue/green to the white. 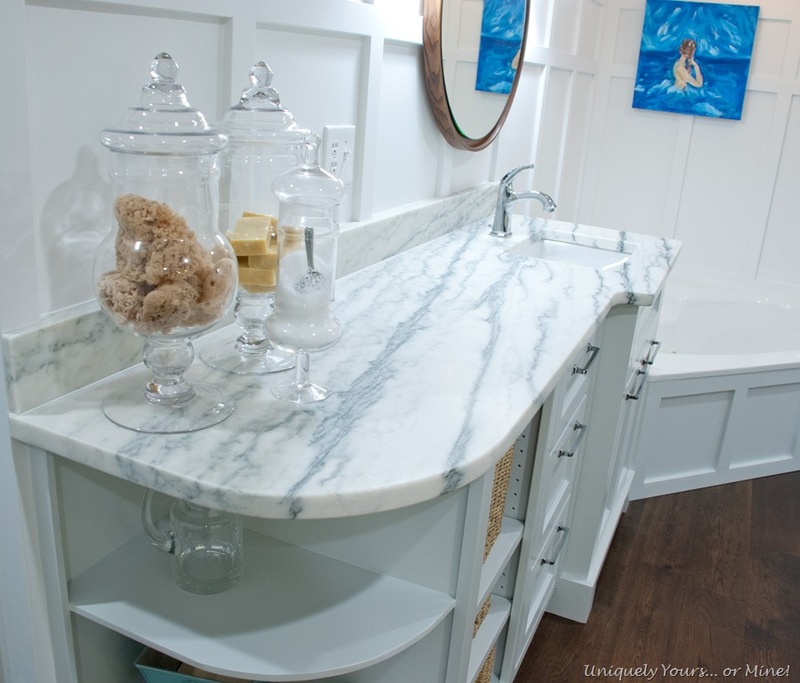 It was more expensive than the Carrera marble we were originally considering, but it is supposedly more dense and honestly I just couldn’t resist all of the beautiful veining… The installers did a great job installing the vanity tops and shower curbing too! 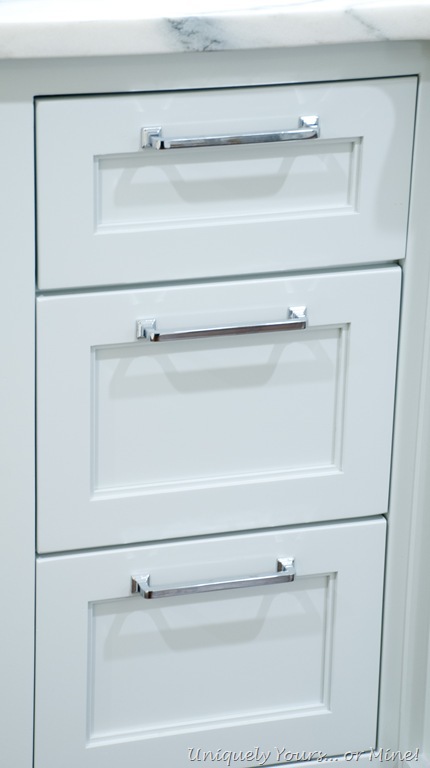 The drawer pulls are polished nickel and I painted the cabinets and tub apron in Benjamin Moore Wickham Gray which is a very light gray with blue undertones. I chose to spray paint the drawer and door fronts, but I brushed the cabinet frames. 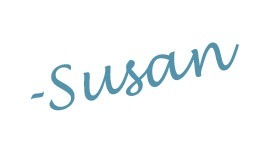 I used the BM Advance line in Satin and it was fabulous to work with and left virtually no visible brush strokes. 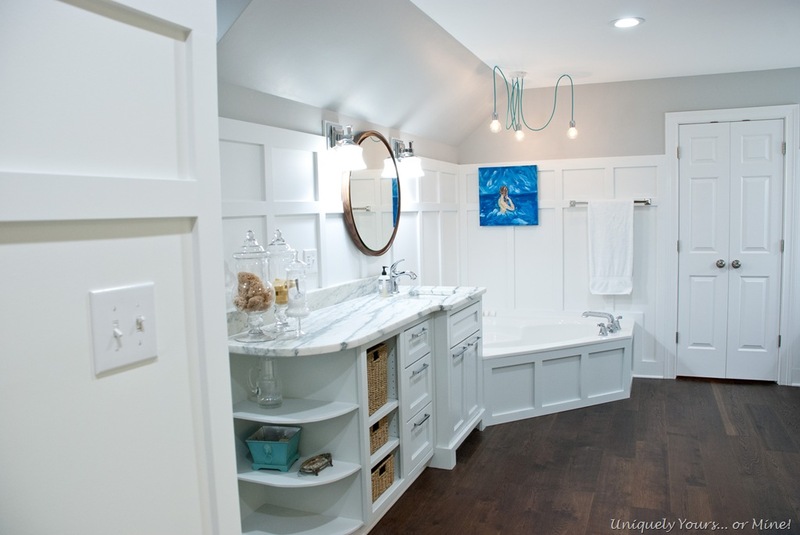 I really wanted to replace my tub with a freestanding pedestal tub, kind of like this one… isn’t it gorgeous?! 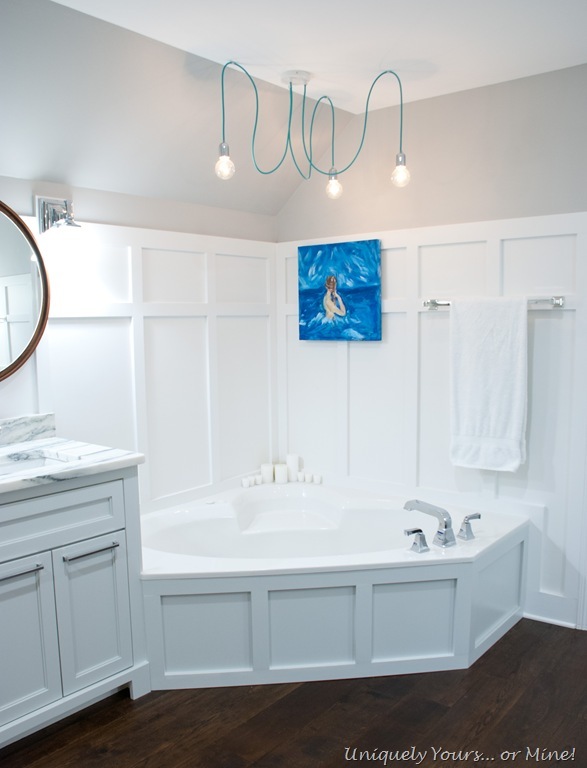 The light over the tub we made with products from the Color Cord Company and it adds a little interest and light in that corner… the lights are spaced perfectly so I can stand up in the tub without hitting any of them. Here’s a Before and After comparison of my vanity area for you… the original builders really loved their mirrors didn’t they? On the Hubby’s side of the bathroom we used this cabinet (1 of the 3 cabinets in the set we purchased off Craig’s List) to create his vanity. 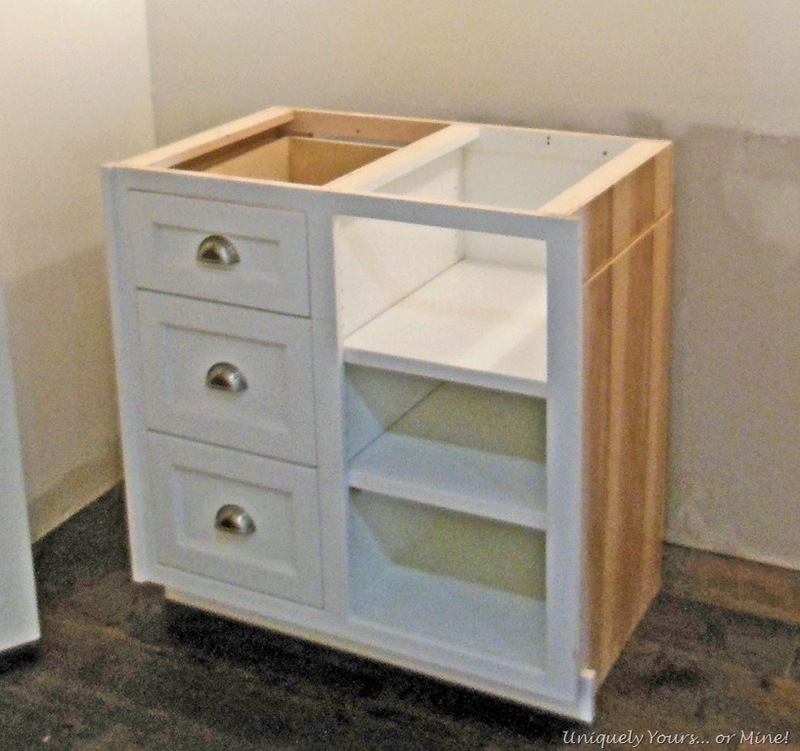 He deconstructed the original cabinet so we could use it as two pieces and then added a new unfinished sink base cabinet from Home Depot in the middle to make this one of a kind piece… I think he did a fabulous job! We were going to make new doors for the center cabinet, but decided to install a removable back and shelf instead. 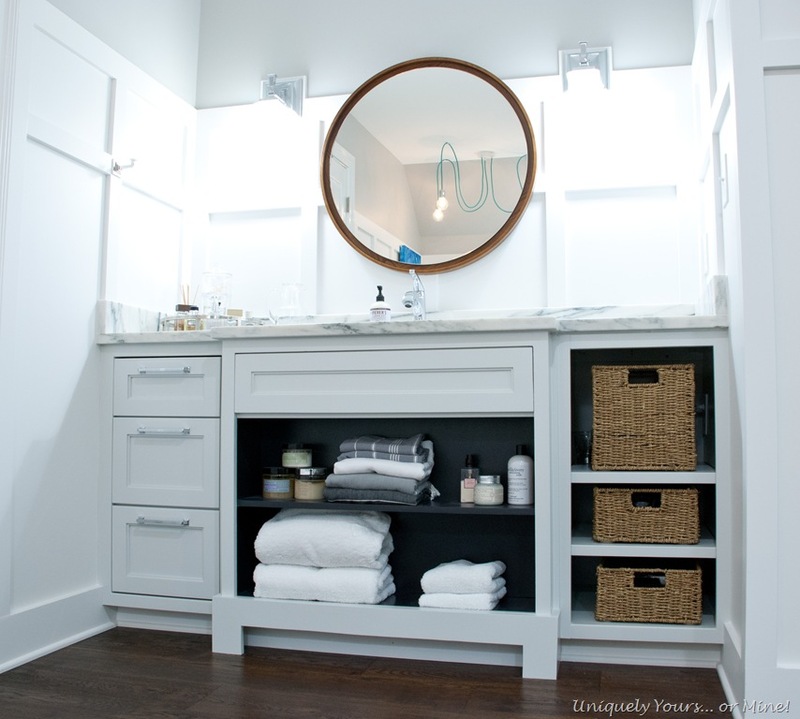 He didn’t need the storage space under the sink and I really love this look! 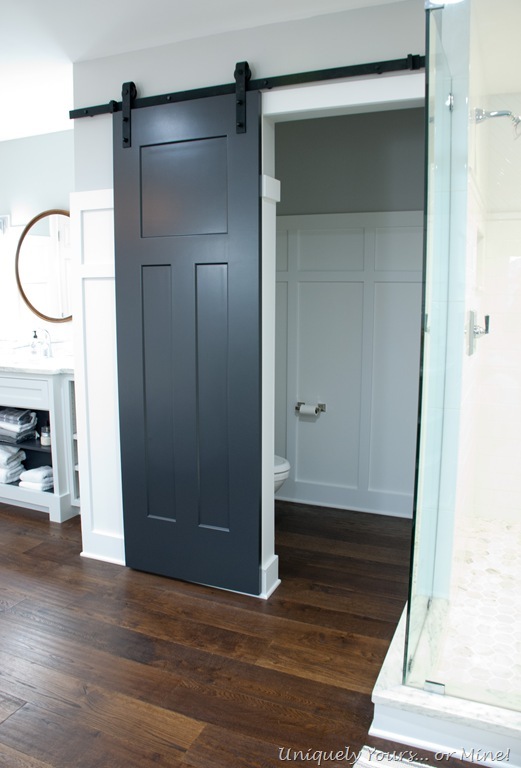 The inside is painted Benjamin Moore Black Iron, which I have also used in many other places in our home. The faucet is a chrome American Standard “Town Square” faucet, all of our faucets and shower heads are from this suite. We prefer the ease of a one handle set, but it is hard to find one that is not too modern looking so I’m really happy with traditional look of this suite. 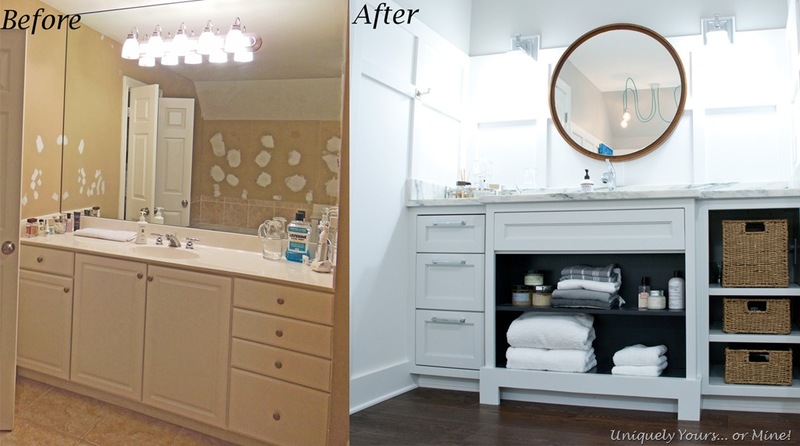 The Before and After of this vanity area. The water closet is no longer for showering too! We installed a new American Standard VorMax toilet and decreased the overall size of the room since there was no longer a shower in it. For privacy we added this solid core door on a barn door track. 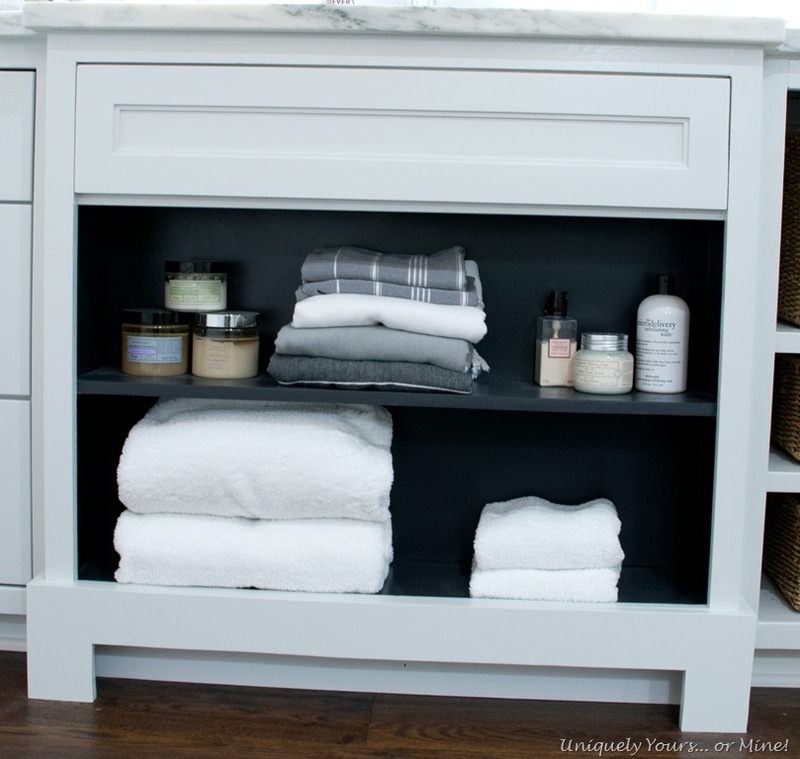 The door is painted the same Black Iron as the vanity cubby. This is now our view of the bathroom from the new closet area… we still have a few cabinets to make before I can share the closet makeover… The runner is Dash & Albert, but I did cut and sew one end in order for it to fit the space exactly. Of the $20k we spent roughly $11,000 was spent on contractors for shower glass, marble installation, plumbing rough in, framing, blown-insulation and sheet rock installation and finishing (items we felt were best left to the professionals). One of our contractors flips houses and when he was here he said that this job was about a $35,000 remodel job if we had hired out all of the work so I was very happy to hear that! I so hope you enjoyed seeing these pictures and following along with this renovation! If you have any questions or comments please leave them below! By the way we will have the closet finished by the end of spring, there’s not much to do but build and paint 4 cabinets but I want to spray paint them so I’m “waiting” for warmer weather! In the meantime we are renovating another bathroom, but this one is small and on a much leaner budget! 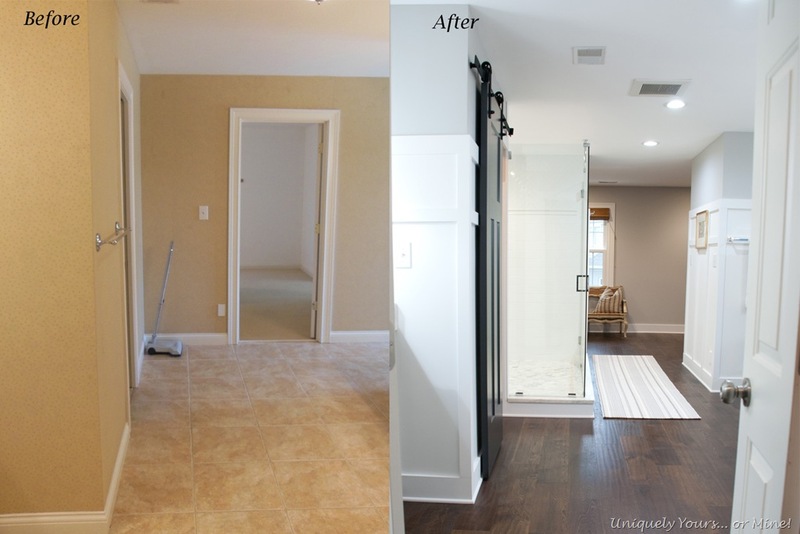 Your bathroom turned out beautiful! 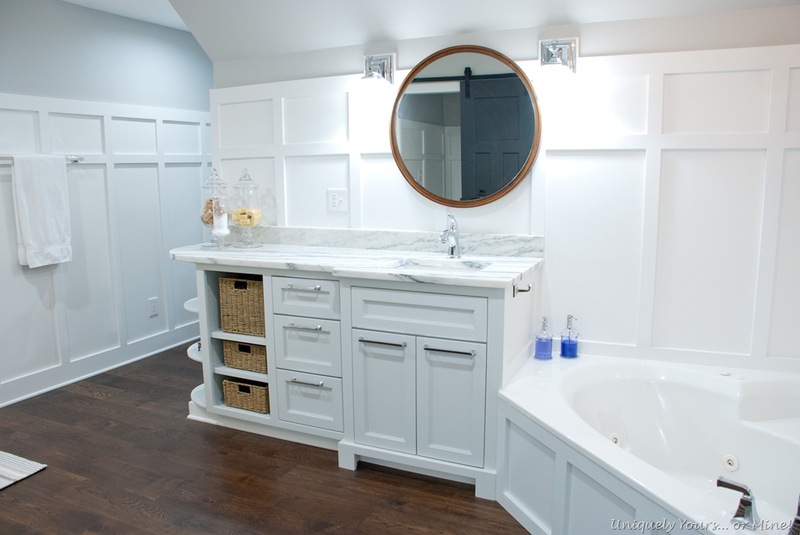 I love the wainscoting and the custom vanity….great job! Fabulous! 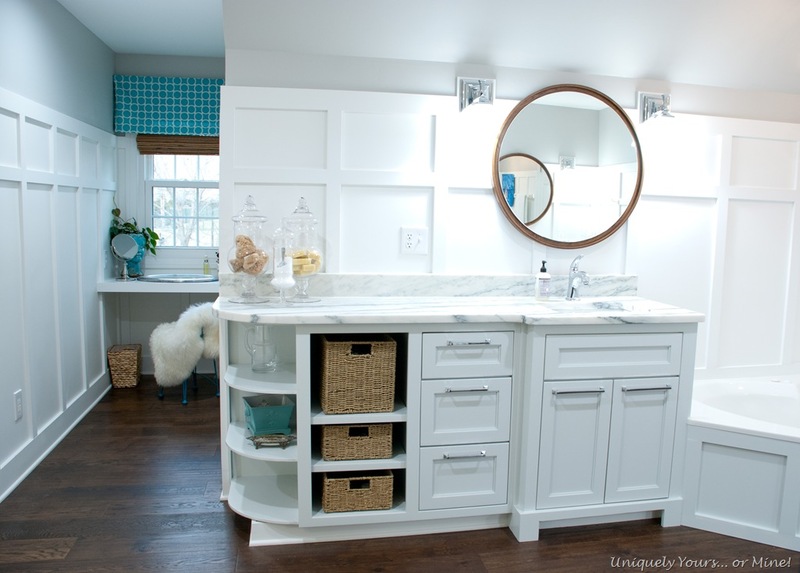 Love the re-worked cabinets. Especially your husband’s side. Thanks so much Joanne, I love his cabinets the best too! It’s Gorgeous! Love love all your renovations. You are inspiring me. I just helped my husband repaint a large old house that has become the new office for his business and feel like I could tackle our house next. ( He won’t pay professionals because he says we do a better job ) I love all your colours just have to work out similar Australian equivalents. Love following your progress. Thank you for sharing! Thanks so much Laurelle! Painting is such a quick way to make a difference in a home, but it’s a lot of work painting a whole house kudos! Thanks Anni! I debated adding the costs, because it certainly wasn’t cheap, but I always want to know so I can factor that in to my decision making process! Holy craaaaaaaaap!!! I’m catching up on your goings-on and I’m blown away! You’ve done an amazing job!! Thanks so much Andi 😍😍😍 I’m so happy we’re getting to enjoy it now versus always working on it! Thanks so much Denise! I certainly love working with my hubby on these projects, we work much better as a team than we do independently as we both have our strengths (and weaknesses) and skill sets that we bring to the table.